Philhealth Dependents — Who Are Qualified? Medical Professionals — Doctors, Nurses, Etc. 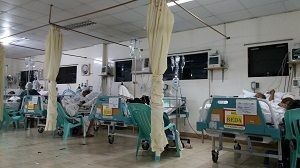 What Are Hospital Levels, as Used by Philhealth? Ask ko lang po magkano ang covered ng sakit na high grade glioma o space occupying lession? Helo…paano mo po mllamn kung magkano na naihulog mo?kailangan po ba pumunta sa philhealth?yung dating membership mo po ba na nagwwork ka dito sa pinas existing pa din hanggang sa naging ofw na po ako? Hi Aileen, ang payments sa past years ay hindi na magagamit. Maconsider na lang ito for lifetime membership starting at age 60. Kapag for use in the present time, for OFW, dapat yong confinement ay within the validity dates sa premium receipt. Kapag individual payor, dapat paid ang 3 months of the 6 months before confinement. ask ko lang po kung ano po ang pagkakaiba ng philhealth at philam life insurance? Hi jeffrey, Philhealth is a hospitalization insurance. It helps you pay your hospitalization costs. Philam life insurance pays the face amount of your life insurance to your beneficiaries in case you pass on to eternal life. Ask ko lang kung anung requirements para ma-encash ung cheque ng member na deceased na. Pwede ba kung ung mga anak ang mag lakad ng papers? Thanks. Hi Kristine, go to the issuing bank and ask because banks have different policies. The bank might require death, marriage and birth certificates and other documents. The fastest way is to go back to the person or company that issued the check and ask for a replacement check in the name of the primary beneficiaries. Show the certificates mentioned. My dad is 67 and will need dialysis in the near future. Is this condition covered under Philhealth? Hi Sarah, yes, dialysis is covered. Find an accredited dialysis center and then ask for their Philhealth packages. Here’a s list of free-standing Philhealth-accredited dialysis centers up to Dec 31, 2014. Ask if the’ll be accredited in 2015. Can i avail of philhealth even if I did not have prenatal where I’ll give birth? Hi jhing, yes, if you give birth at a hospital. If lying-in or maternity clinic, it depends on the clinic. Hi thersa, you should pay Jan to March asap, and then in April, pay for April to June.